The new website is available to the entire Emory community as well as to interested external participants. Although many clinical trials are seeking patients who have a particular disease, many others are seeking healthy volunteers. 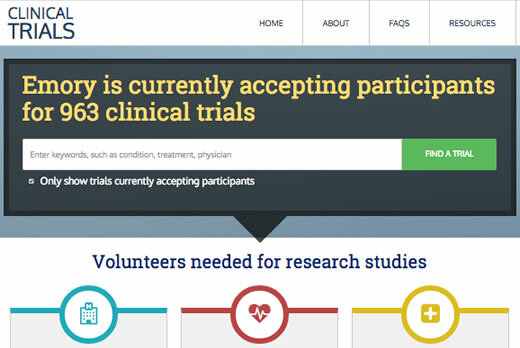 Individuals also may register through ResearchMatch.com, a national database that connects potential volunteers to new clinical trials seeking volunteers. "Clinical trials are a key part of Emory's research mission, which helps lead to the approval of new lifesaving medicines, medical devices, and treatment protocols," says David Stephens, vice president for research in Emory's Woodruff Health Sciences Center. "As an academic medical center, Emory stands out in its ability to conduct numerous clinical trials sponsored by both the National Institutes of Health and industry." "Emory's ability to develop improved therapies through clinical research is a key component of our clinical mission and gives patients access to the most advanced treatments available," says Jeffrey Lennox, MD, associate dean for clinical research in Emory University School of Medicine. "This new clinical trials website will allow more people within Emory and the broader community to learn about and participate in the wide range of available clinical trials."